This page will tell you how to complete the path from Life Scout to Eagle. If you have questions, please contact Mr. Uchitel. He has helped many Troop 175 boys earn their Eagle rank. Here are the basic requirements for becoming an Eagle Scout. All of the work to become an Eagle must be completed before you turn 18 (except for the Eagle Board of Review). Spend 6 months as a Life Scout. Demonstrate Scout Spirit by living the Scout Oath and Scout Law, and by participating in Troop meetings and outings. 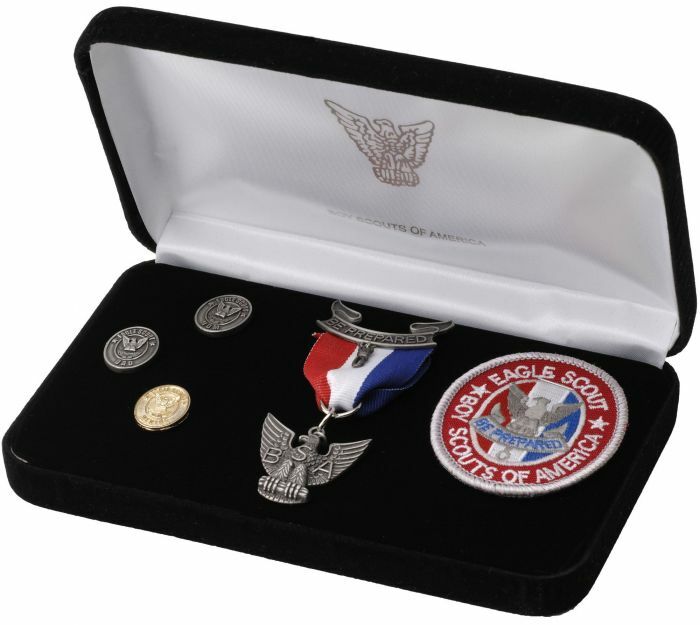 Earn 21 merit badges, including 13 specific required Eagle merit badges (see below). While a Life Scout, actively serve in a Troop 175 position of responsibility for 6 months. Complete an Eagle Service Project to benefit a religious institution, school, or your community. The project must be presented to the Troop Committee before you begin and after you finish. After completing your Eagle project, participate in a Scoutmaster conference. Complete an Eagle Board of Review. Don’t wait until the last minute. Several of the Eagle-required merit badges are complicated and some of them take 3 months to finish. When planning your Eagle project, build some extra months into your schedule because you must get approvals from several different people/groups before and after the project. Take some time to learn about the process and requirements for becoming an Eagle. Eagle Scout Rank Process: This important guide tells you the details of the Eagle rank application process, including the rules for the Eagle Project. Eagle Rank Requirements (with links to merit badges): This tells you the specific requirements you must meet to become an Eagle Scout. Eagle Rank Requirements Checklist: this list of requirements lets you write down the steps you’ve completed. You’ll need a total of 21 total merit badges. 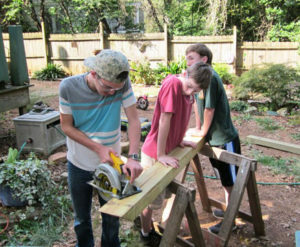 They can be earned at any point since you became a Boy Scout–before, during or after your Eagle project. You must earn the 13 Eagle-required MB listed below. Choose only one of the MB listed in categories h, i, and k. Any additional MB earned in those categories can count as one of your eight optional merit badges. Many Eagle projects involve building something, but that isn’t a requirement. Take a look at some of the past Troop 175 Eagle projects or search the web if you need ideas. You will plan, develop, and give leadership to others in a service project for a religious institution, school, or your community. This organization is called the Project Beneficiary (the project can’t benefit Troop 175 or BSA). 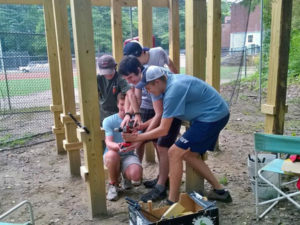 The idea of the Eagle project is for you to do the planning and preparation, then guide other Troop 175 Scouts as they do the hands-on work of the project. Once you have an idea for your project, contact Mr. Uchitel and get his feedback before you begin the paperwork for your proposal. To learn more about the rules for the Eagle Scout service project, see topics 9.0.2.0 through 9.0.2.16 of the Eagle Scout rank process document. You will use the Eagle Scout Service Project Proposal (BSA publication No. 512-927) to describe your project and make a plan to successfully complete the project. We call it the workbook. You must save this file to your computer, then use Adobe Reader 9 (or later) to open and edit the file. This allows you to import images and use expandable text boxes. Don’t open this pdf workbook in a browser (Chrome, Firefox, Internet Explorer, Safari, etc.). Another dialog box will appear. Name your “save as” file and choose where to save it. Once you’ve saved the workbook to your computer, open Adobe Reader (version 9 or later) and click “File,” click “Open,” and open the file you just saved to your computer. Now you can type directly in the form and add pictures. If you try to open the pdf file in your browser, you can’t type in it. The workbook contains 3 sections: 1) Proposal, 2) Project Plan and 3) Project Report. You’ll begin by filling out the Project Proposal Pages B, C, D and E of the workbook with some basic info about your project. It’s helpful to include drawings, photos and other visual aids to explain the project. Don’t worry about small details…you’ll provide these later in the Project Plan. Mr. Uchitel will help you if you have questions about the project or workbook. Make sure you keep the Project Proposal page E with the original signatures. You will need these signed pages later. The next step is to fill out the Project Plan section of the workbook. This will help you think through the details and specifics of how your project will be accomplished: materials, hours of work needed, safety, tools, supplies, food, etc. Organize the workdays and provide necessary equipment and supplies (and food!). Recruit scouts to come to your workdays. Manage other scouts as they do the work. Have someone take pictures of the work in progress and of the completed project. Keep a log of the scouts’ names and record how many hours they worked on your project. Turn in the log to the Scoutmaster so the volunteers get credit for service hours. Make sure you keep the Project Proposal page E and Project Report page C with the original signatures. You will need these signatures for your Eagle Application. Once all the requirements for the Eagle rank are completed, you will submit an Eagle Application. You must use the official Eagle Scout Rank Application, No. 512-728. No other form or application method is permitted. It’s easier to fill out the PDF form on your computer, but you may also print the PDF form and fill it out by hand. Plus two additional references: friend, neighbor, coach, etc. To make it easier to get the info from the references, Troop 175 requests that you ask for letters of recommendation from the people you list as references. Right click the Eagle Scout Letter of Recommendation form. Click “Save target [or link] as:” and save the file to your computer. Send a copy of this form to each person you listed in your Eagle Application requirement 2, and request that he/she write a confidential Letter of Recommendation. The letter writer should email the completed letter to Jason Uchitel: [email protected] (not to you). If the person doesn’t use email, you may print the form and send it to the person along with an empty stamped envelope so he/she can mail the letter. The empty envelope should be addressed to Mr. Uchitel. You can ask him the correct address to put on it. Mr. Uchitel will send the signed project workbook and Eagle Application to the Council (including the attached Statement of Ambitions). They will verify all the information is complete and send the documents back. The Council will tell the District Eagle chair that the scout is eligible for an Eagle Board of Review. Each Eagle candidate presents his Eagle Project Proposal at a Troop 175 Committee meeting before submitting it to the District. This is to help give the scout guidance toward the successful completion of his project, and for the parents of future Eagles to understand what an Eagle project is like. We also require the scout to present a recap of his completed project at a Troop 175 Committee meeting before the Scoutmaster signs off on the completed project. The committee likes to see photos, drawings and other info that helps explain your project. Please bring several copies of your proposal or report to the meeting so the committee can follow along. Make sure you bring any pages that require signatures. The Scoutmaster and Committee Chair must sign the same copy that was signed by the Project Beneficiary. Don’t want until the last minute! When thinking about the timing of your project and completion of your merit badges, make sure you leave time in your schedule to attend these two meetings. The Troop Committee meets once a month, typically on the first Monday of the month. Check the Troop calendar for meeting dates. Get clearance from Mr. Uchitel. Email the Troop Committee Chair, Michael Leavey ([email protected]) and ask Mr. Leavey to be put on the agenda. Please also copy (cc) Mr. U. ([email protected]) in this email. Please make your request at least 2 days before the meeting date.